Music Ed Tech Talk is a blog by mutechteachernet.com. The goal of mttn is to advocate for music technology programs in schools across the globe, support teachers of music technology classes with resources and tools for their classroom, inspire students through their teachers and create a new wave of musical producers, composers and performers by sharing and encouraging the use of digital tools and resources to unlock musical creativity. I don't know if any readers of this blog had a chance to see the CNN broadcast on Wednesday, February 21 of the Town Hall Meeting from Broward Co. Florida in response to the horrendous school shooting that took place at Stoneman Douglas High School on Valentine's Day, but it was remarkable to watch. The community filled an arena with about 8,000 students, faculty, parents and other community members to share their experience of the shooting with the world and ask some very direct questions to some brave law makers who attended. All in an effort to ignite and continue a movement to bring an end to the violence that was brought into their school and others. I am not interested in getting into the politics of this event because that is not what this blog is all about, but if you watched the telecast until the end you were able to witness the power of music and education. We started one of my favorite units of study in my music technology classes this week. I design most of my instruction around the 5 elements of music: rhythm, melody, harmony, form and expression. At this point in the semester, we have covered the first four and this is the week that we start with expression. The first lesson of this unit always begins with this question for discussion: Why do people create music and songs? The students begin offering ideas: for personal enjoyment, to entertain, express their feelings, tell a story, make money, become famous, communicate, etc. This discussion leads us into writing lyrics for songs and I have a couple of songs that I usually play for the class. We listen to the lyrics, dissect them to discover who the audience is, literary devices used such as simile and metaphor, rhyme schemes, sentence structure, etc. The students get it. They basically understand the difference in the intent of a song such as "Who Says" performed by Selena Gomez versus "What Does The Fox Say?" performed by Ylvis. Nevertheless, no matter the purpose or the intent of these songs they are still inherently commercial. It is difficult to present a truly personal example of intent and purpose in musical and lyrical composition. Well that certainly changed at the end of the CNN program that I mentioned at the opening of this entry. I played this performance for my students today and I don't believe that there is a better example in existence to answer the question why do people create music, or perhaps, even better, why should people create music? My students were moved and affected by the music. I listened to the song six times today in my classes and cried every time. I truly believe that the group of students that I have right now will go through this unit very differently than any other class I have ever taught before because of the example by this group of students. In another blog entry or perhaps on the website I will post the lesson plans for this unit or maybe give a follow up to this post, but this is the point that I hope readers will take from this entry: Teaching students how to create music and how to perform as a means of self expression is important, critically important. This could not be illustrated in a more powerful way than by what these students created in this moment. Thank you to the teachers who taught these students how to create and perform! If not for you, this song would likely never have been created and shared. Whoever taught them this will likely never come forward on their own, because that's not what we teachers do. But, I can imagine what was going on in their heads and hearts as they watched and listened to what these students created. Their teachers have given those students an incredible gift and because of their gift, those students have given something to their friends, school and community that cannot be valued highly enough. Lenny would be proud and so are the rest of us! I cried too - Lenny would be proud indeed! 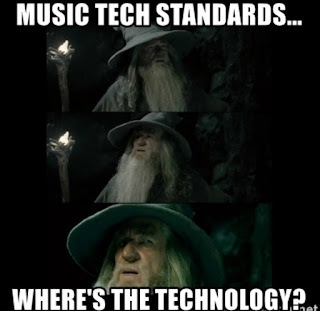 Why is there no technology in the music technology standards?